Keep tabs on everyone. Maintain a personal "database" of all your important business and personal contacts. The X-TOOL lets you find and locate virtually anyone on the Internet -- plus you can easily start storing, organizing, and maintaining your own "private files". 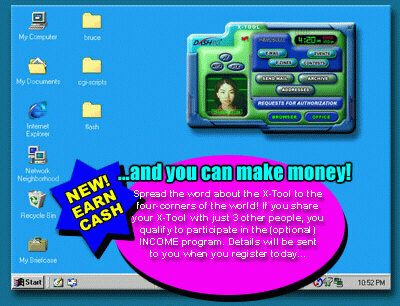 And with point and click ease, you can send email, print a letter or send a fax, making the X-Tool your all-purpose "global" net-communication tool!